From February 18 to February 25, he plays Rodolfo in Puccini's LA BOHEME in the Teatro Communale of Cagliari. The conductor is Steven Mercurio. 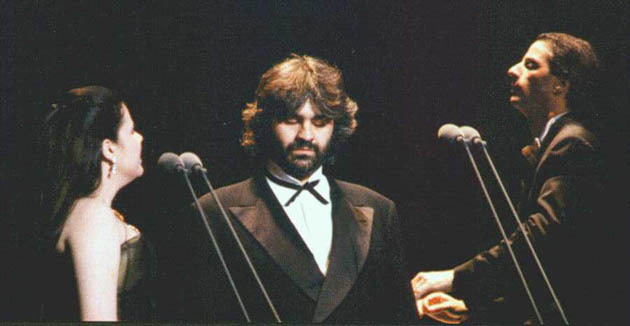 The Mimi at his side was represented by Daniela Dessi. This was transmitted by RAI TV on February 28. On April 19, he enters the American show business. He gives a concert at the Kennedy Center in Washington and the next day President Clinton receives him at the White House. On May 5, in Monte Carlo Andrea receives two World Music Awards, one in the category "Best Italian Singer," and one for "Best Classical Interpretation". In July and August, he tours North and South America. His last concert at the legendary Madison Square Garden is sold out. In September, in Germany he receives his next Echo Klassik for the best-selling classical album "Aria". "I heard someone say: If God had a singing voice, he would sound a lot like Andrea Bocelli." "Con Te Partiro" in their advertisments, which helps him become even more well known in the USA. Elizabeth Taylor is among his fans. 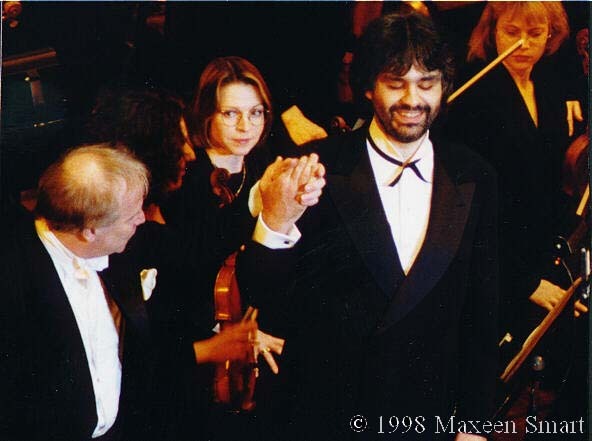 This chronicle was compiled by Bocelli.de. Assurances for the complete accuracy of some of the details cannot be given. Any text or photo may not be used in any media or on any site, or be distributed in any way without express permission from the author or photographer.